VoIP service Fring has launched four way video and voice chat for iOS and Android handsets, Tech2 reported earlier today. 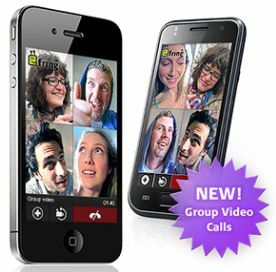 With Fring's app, users can use their mobile Internet connections to make free phone and video calls as well as chat. For video conferencing, they need Wi-Fi or 3G connections. "There is no reason why users need to run home to their PC in order to have a 'spontaneous' video call with their friends and family. Users love seeing all their friends at the same time, on one screen, but want to be able to do it, when and where they want," said Avi Shechter, Co-Founder & CEO of fring, in a media release. Fring uses a proprietary technology called DVQ to deliver high quality video. The company claims it is adding more than a million new smartphone users every month to its userbase. The app will allow a user to set up a video chat with four simultaneous users. The application is free and can be downloaded from the Android marketplace. The only charge will be on data usage, depending upon your cellular service plan. Other chat apps available on the Android platform are Qik and Skype, Nimbuzz, eBuddy and Mig33. Rumours abound that Google is also preparing to release a native video chatting application for all Android devices.